My book on Vitamin D looked at the powerful medical journal evidence that Vitamin D-3 can prevent or cure malignant melanoma but the latest information expands the powerful role of Vitamin D to at least delaying the onset of Typ[e 2 diabetes. β cells have a profound effect on insulin sensitivity which is the real problem with diabetes. Summary from Cell: "A primary cause of disease progression in type 2 diabetes (T2D) is β cell dysfunction due to inflammatory stress and insulin resistance. However, preventing β cell exhaustion under diabetic conditions is a major therapeutic challenge. Here, we identify the vitamin D receptor (VDR) as a key modulator of inflammation and β cell survival. Alternative recognition of an acetylated lysine in VDR by bromodomain proteins BRD7 and BRD9 directs association to PBAF and BAF chromatin remodeling complexes, respectively. 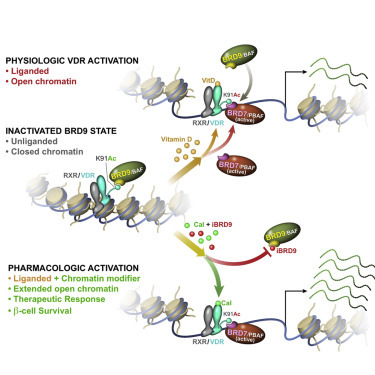 Mechanistically, ligand promotes VDR association with PBAF to effect genome-wide changes in chromatin accessibility and enhancer landscape, resulting in an anti-inflammatory response. Importantly, pharmacological inhibition of BRD9 promotes PBAF-VDR association to restore β cell function and ameliorate hyperglycemia in murine T2D models. These studies reveal an unrecognized VDR-dependent transcriptional program underpinning β cell survival and identifies the VDR:PBAF/BAF association as a potential therapeutic target for T2D." Arnush, M.Heitmeier, M.R.Scarim, A.L.Marino, M.H.Manning, P.T.Corbett, J.A. IL-1 produced and released endogenously within human islets inhibits beta cell function.